I’ve come to learn that in 2014 apparently stolen valor isn’t that big of a deal to most people. I knew of the term “stolen valor” for a while, and heard of some cases in the past but never really had semi-direct experience with it until the whole Cory07Ink debacle. You can read about it at the link, but he mis-represented himself as prior military. It’s documented in videos and if you follow the link above his own girlfriend (Erika) asks him the direct question and he answers “yes”, so there’s no disputing that at all. I don’t come from a military family, and haven’t lost anyone in a conflict so I’m about as far removed as you can get from someone that should be offended by another making a false “prior service” claim. For me, I just find it very interesting / disappointing from a personal integrity standpoint. If you’ve fought for the country, and/or even lost family or friends who have… do you care or not care whether someone falsely represents themselves as one of those who did indeed serve? Another recent case of this that came across my desk yesterday, was when someone tagged me on Instagram in a picture of some girl named “Amy Jane”. I didn’t recognize the name at first, but after googling her, I instantly remembered her from some vids she did with shooter Taran Butler. Anyway, it turns out she was discharged after 88 days in bootcamp and yet she has been calling herself a Marine for years. Sure SOME people are pissed for obvious reasons, and because it appears to have landed her some pretty sweet jobs within the industry and even on TV… but there is also a huge outpouring of support for her on Facebook (negative comments obviously blocked). I’m really scratching my head at the positive part of the reaction after reading the details on that one too. Yea she’s smoking hot, so that probably has at least something to do with it. I still give her a 0/10 though, would not operate with. Thoughts? Would operate with Cory & Erika or Amy Jane? I’m always a big fan of bloopers. I wish more YouTubers would come out with blooper vids occasionally. I couldn’t help but notice they aren’t running notch hats or tactical arm tape. 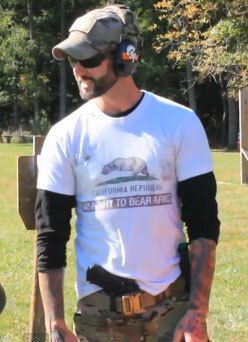 Cory is running the Oatmeal color California No Right To Bear Arms t-shirt in the video a few times. I’m not going to lie, when you learn something here chances are it will be accident because someone doing the teaching has one of my company’s t-shirts on. 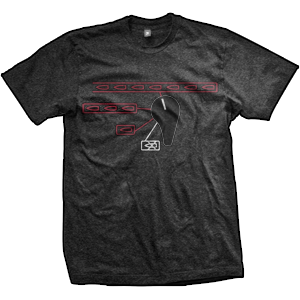 Such is the case here :P Cory is sporting his trademark tightly manicured operator AF facial hair and the Pictogram Fire Selector Switch t-shirt… a deadly combo. They run a training school (Range Time) out of Lewis Indiana if you’re looking for some instruction.